We are all aware of how good IHM (the group behind Posto Pubblico, Pizzeria Pubblico and Linguini Fini) is at making Italian food, successfully sending me home every time with a pasta/pizza-fuelled smile. 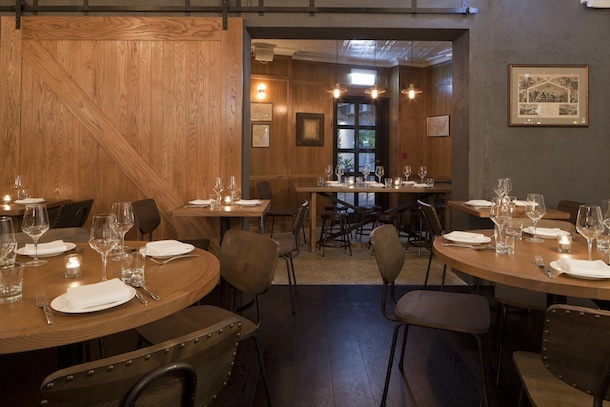 Their new venture, Stone Nullah Tavern, however, is completely different. This time, instead of New York Italian cuisine, chef Vinny Lauria is serving up ‘New American’ cuisine. What exactly is New American cuisine, you ask? Vinny describes it as something which is unrestrictive, where the fresh, high-quality ingredients dictate the menu, taking influences from all over the world. 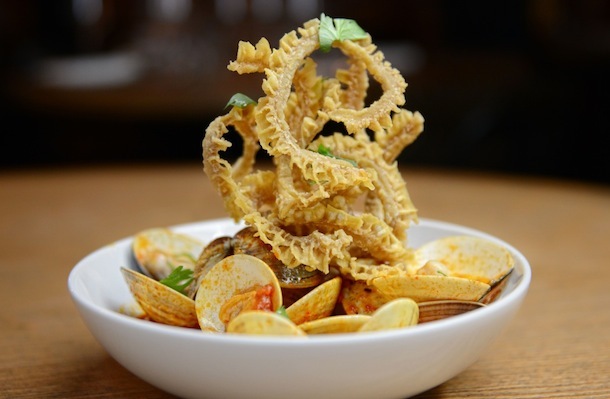 We have learnt from IHM’s other restaurants that they use nothing but the best, mostly locally sourced, ingredients, and we can expect nothing less from Stone Nullah Tavern. Vinny visits the farmers himself, to see what is in season, and from this, creates his menu; if it is not in season, he won’t make it, so expect the menu to change fairly frequently. 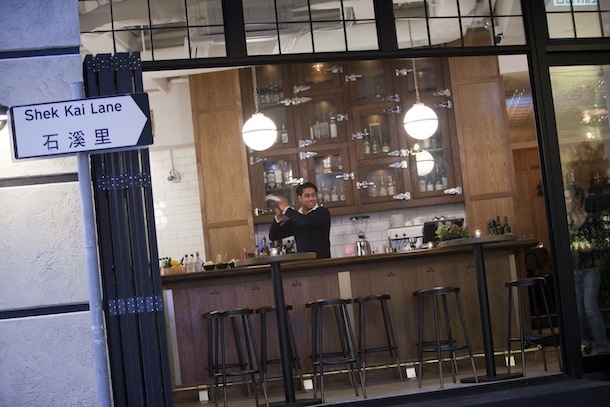 The space is also unique, with open French windows overlooking historic Stone Nullah Lane in Wan Chai. Wooden panelling, pressed tin ceiling tiles, handcrafted furniture and old photographs and maps give it a cosy, vintage feel that makes you want to linger over a lengthy dinner with plenty of good wine. Start the night with a cocktail at the bar, choosing from a wide range of boutique branded liquors. The Southsider is an exciting take on a classic G&T, consisting of Farmer’s Organic Gin, lemon juice and mint that went down far too easily for a ‘school night’. Needless to say we of course had to chase this with some excellent wine, once seated – in this case a Cabernet Sauvignon from Francis Ford Coppola’s (yes, the director of The Godfather) winery, Inglenook. Unlike the gigantic portions stereotypically associated with American cuisine, Stone Nullah Tavern serves small, sharing-sized dishes, perfect to keep our foe Food Envy at bay. Despite being almost the end of the season for heirloom tomatoes, the tomatoes with vinegar, mint and chilli were wonderfully refreshing and bursting with flavour, and created a great start to the feast. As, in fact, did the butter lettuce salad, loaded with hickory-smoked bacon, Stilton and deliciously creamy ranch dressing – perhaps not the healthiest choice of salad, but who’s judging?! 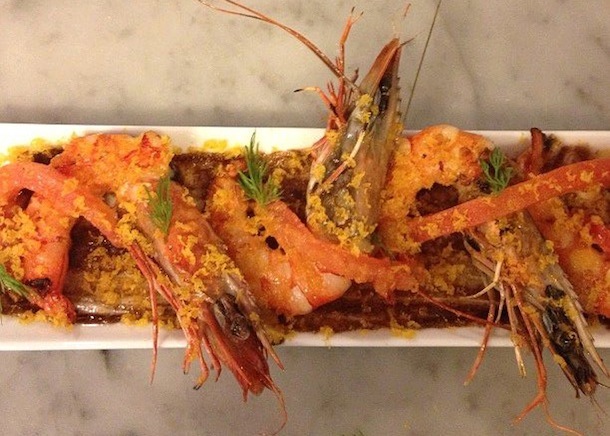 The grilled prawns with bottarga and black aioli were perfectly fresh and bouncy, the black aioli delicately bringing out the prawns’ deeper flavours. Despite not normally being a big fan of chicken wings, there is something dangerously moreish about SNT’s wings, generously marinated in a spicy honey sauce and served with more of that creamy ranch dressing – quite literally finger licking good. Do not go to SNT without trying the crispy pig’s head with lobster salad, even if your wimpy nature doesn’t like the thought of eating the head of any animal; it is incredible. The pork is brined for six days and then braised for six hours to create a succulently tender terrine, which is then breaded and deep-fried, almost like a Milanese. Although it sounds outrageously heavy, the chunky lobster salad somehow manages to make it less decadent, whilst even more delicious. Foie gras burgers are the ‘in’ thing at the moment, it seems (see my earlier review of 22 Ships), and SNT’s version does not fall short of the mark. The blend of OBE beef cuts melted in the mouth, whilst the caramelised onion marmalade served to cut the richness of the foie gras. The cherry on top was the Chinese-style milk bun, a childhood comfort that completed this scrumptious burger. 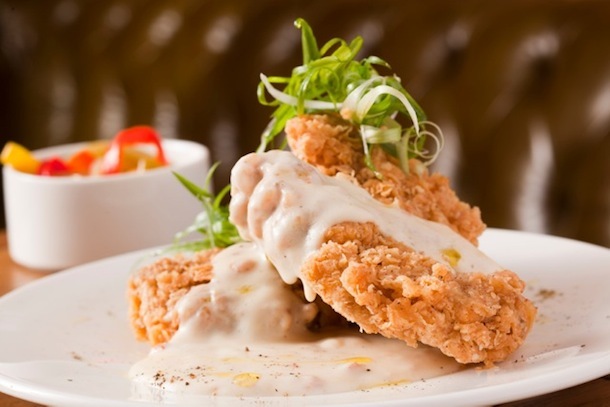 Don’t be fooled by the sound of the “chicken fried” tenderloin – this dish has never even seen a chicken! It is so called due to its likeness to the classic southern American fried chicken, yet beneath the crispy layer of batter is wonderfully tender (true to its name), rare beef, all doused in a rich, peppery sausage sauce. Also delicious are the clams, surprisingly served with crispy tripe ‘fries’ that work as the perfect dipping tools for the delicious white wine, tomato and chilli sauce. Pair all of the above with some homemade Boston baked beans and some mac & cheese, made here with pasta shells and egg yolk, a la carbonara, and you will think you’re in heaven. There is always room for dessert, yet there is definitely not room for all five desserts; I speak from experience. Definitely save space for two: the ‘Fat Kid Cake’ and the ovaltine ice cream. 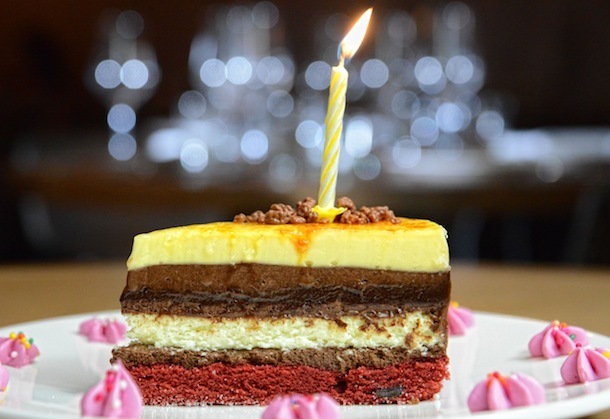 The appropriately named Fat Kid Cake contains layers of red velvet cake, NY cheesecake, crème brûlée and dark chocolate mousse. A heart attack waiting to happen, yes, but a worthwhile heart attack! Each slice is served with a candle, making every day your birthday. If it’s possible to trump this cake, the ovaltine ice cream succeeds in doing so. Not only is the ice cream deliciously silky smooth, but it is served on a bed of molten chocolate, alongside caramelised mini bananas and incredible chunks of peanut butter fudge. Need I say more? Service at SNT is excellent; the staff are very knowledgeable about each and every dish and are more than willing to give their personal recommendations. Prices range from $70 to $170 per dish; not expensive per se, but if, like me, you cannot hold yourself back from trying almost the entire menu, then you might be in trouble. Once again, IHM have succeeded in putting a food-induced smile on my face…as well as perhaps a few extra pounds! I’ve been having dreams of that Fat Kid Cake ever since I first read about it in a magazine somewhere…droooooool. Well you better go and get a slice then! Definitely one to share though as it is rather a lot for one! Hi Michel, Thanks for your comment and sorry to hear you had such an unpleasant experience at SNT. I have been twice and was impressed both times. I do agree that the prices are a bit steep but I do know that the quality of ingredients they serve is very high. i only just now discovered this place. i have to say i was very much impressed (which i rarely say about any establishment). i went with a girlfriend after work and then later my hubby met us. all 3 of us give it a high rating. the staff were insanely nice and accommodating. i find most places in hong kong the staff are not that friendly and if they are they rarely go the extra mile. here, not one but many of the staff went out of their way to welcome us and make our experience an enjoyable one. the happy hour is amazing and the delicious pizza and burger topped off our night. also although a bit small the crispy spicy fries were a hit with us. i will for sure go back and probably take more of my friends. great recommendation, thank you!